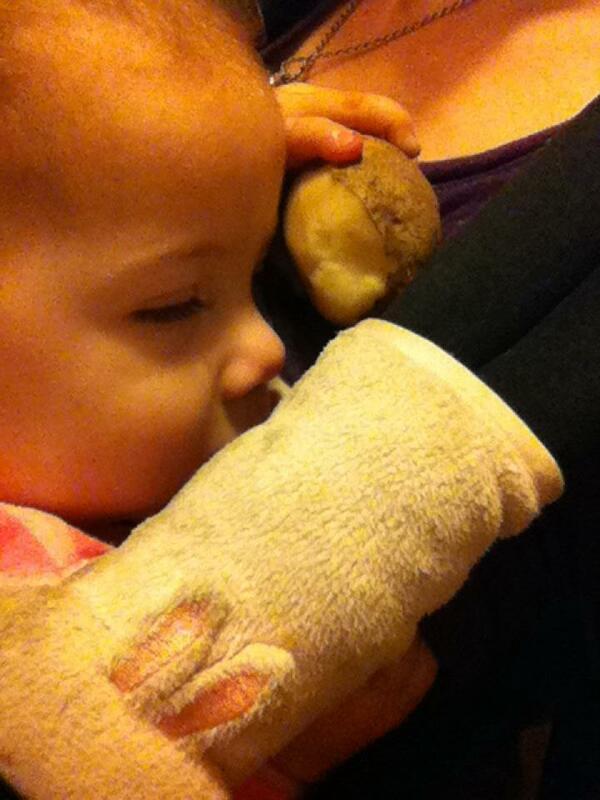 She is nursing here and holding a partially peeled potato. She likes to fall asleep holding something--and those somethings are often very random. I’m just bursting with ideas for blog posts recently, but Alaina has other ideas for me namely with regard to her sleep “schedule.” She has had several days recently where she has only napped for 15 minutes. At night, she insists on sleeping with her head on my arm, which is really fine and pretty sweet, but since she goes to bed at about 8:30, I am then “trapped” there in the dark (light has to be off for her to go to sleep too) for hours and hours. (My iPad helps make this work.) With my boys, I could usually sneak away after they fell asleep. She, however, pops awake when I reclaim my arm. In the morning, I can’t get up before she does either, because she is still on my arm and pops awake when I try to sneakily wiggle away. I’ve surrendered to these things, knowing that they will pass soon and enjoying the fact that my baby has spent every night of her existence sleeping in my actual arms, but I have not surrendered to the notion that I’ll be able to put her down for a nap during the day! I nurse her to sleep for nap while walking her in the Ergo and then put her down on the bed. Today…popped up. This weekend…popped back up. Uh oh. Let me save you some money: In a life with children, balance does not exist. Once you’re a parent, you can figure you’ll be out of whack for the rest of your life…Children are not born to provide balance. children are made to stir us up, to teach us how angry we can get, how scared we can be, how utterly happy, happier than we’d ever imagined was possible, how deeply we can love. Children turn us upside down and inside out; they send us to the depths and heights of ourselves; but they do not balance us. We can’t balance them either, and that’s a good thing, too. They’re finding out how to live in the world, and the most we can do is make them as safe as possible and have a good time with them. I have struggled in the past when things like this happen thinking I need to give up my blog, but in the last year, I’ve accepted it is one of my favorite hobbies and should actually be the last thing to go. I’ve also come to the conclusion that it is a legitimate avenue for writing, providing me with countless seeds for later article and book projects, not to mention the personal posts serving as a “time capsule” or memory record for both me and my kids in the future.